�How to dominate moe contests� is bound to be one of the books on the countless shelves of Patchouli's library. And, considering that witches are said to write many of their books themself, she might even be an expert on the subject. What Patchouli wouldn't normally do, though, is leaving the comfortable interior of her dwelling to test her theories in practice. �A bit of trouble is good for you,� she remarks �but I don't like trouble.� However, an opportunity to meet face to face with yet unrecorded mysteries � modern-world magical girls, robots and the legendary creatures called high-school girls � might be something even Patchouli can't refuse. After all, the best books are those based on personal experience. 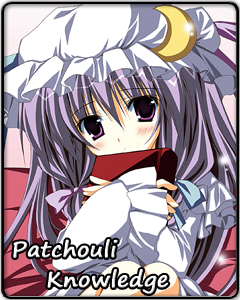 And besides, Patchouli might not be as opposed to the idea of some good company as she likes to pretend to be. She certainly copes with her whimsical vampire friend and that friend's destructive sister easily enough. Her countermeasures against burglar witches visiting her library seem curiously inadequate, too. Why should you go out of your way seeking trouble when it comes to you of it's own accord? Welcome, then, to the Voile library. Keep quiet, be careful with the books and remember to give the librarian a hug. Mukyu~.